A two-hour ride from the city of Indore can take you to a land where layers of time seem to have been compressed in graceful ruins. This is Mandu— the largest fortified city of medieval India. 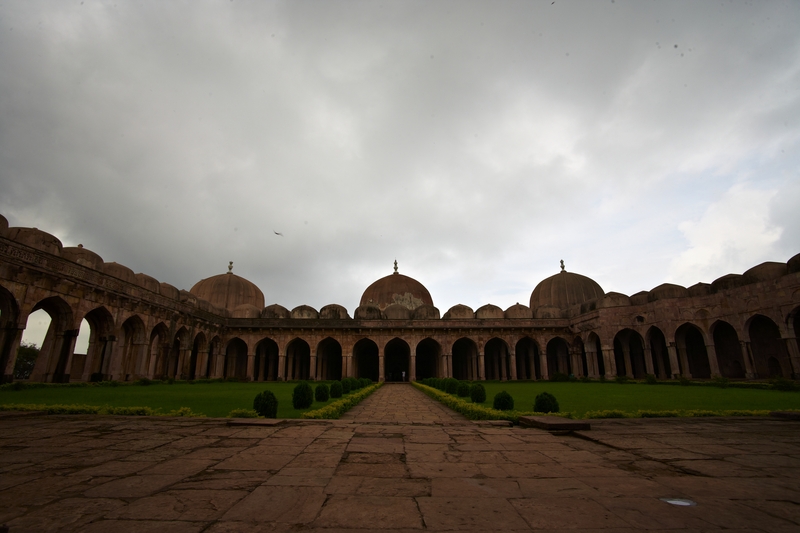 During monsoon, Mandu is most romantic. The loveliness of the pastel shades of the monuments of the Mughal era set off against the brilliant green scenery is doubled as it gets reflected on the ubiquitous water bodies. 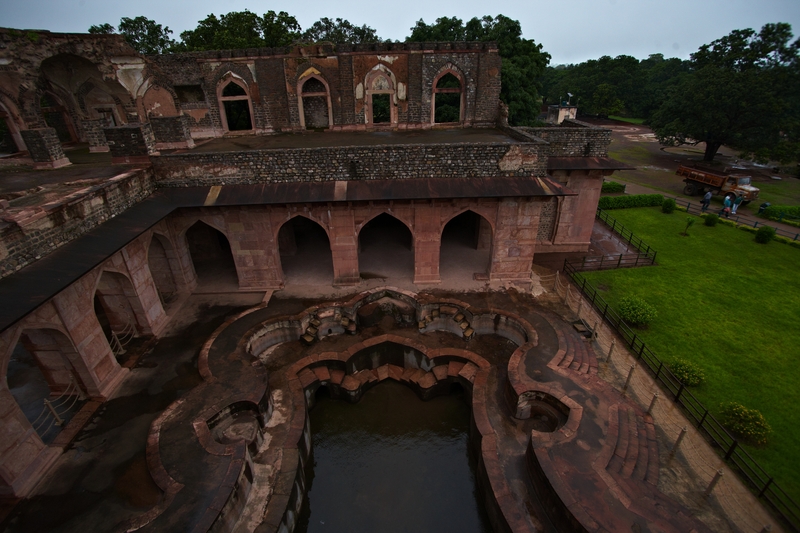 There are very few places in Central India with such pleasant weather that can match the artistic appeal of Mandu. But don’t come here for ruins, come here for stories— stories of unparalleled love of Baz Bahadur and Rani Roopmati. The picture of a fort city shrouded in an indecisive monsoon mist is hard to fade. One can book a room in the MPTDC resorts which are usually better than the others. Quietly elegant and beautifully carved, the resorts offer perfect harmony with nature. One can also book tents. One of the weirdest is of Ghiyas-ud-din Khilji. 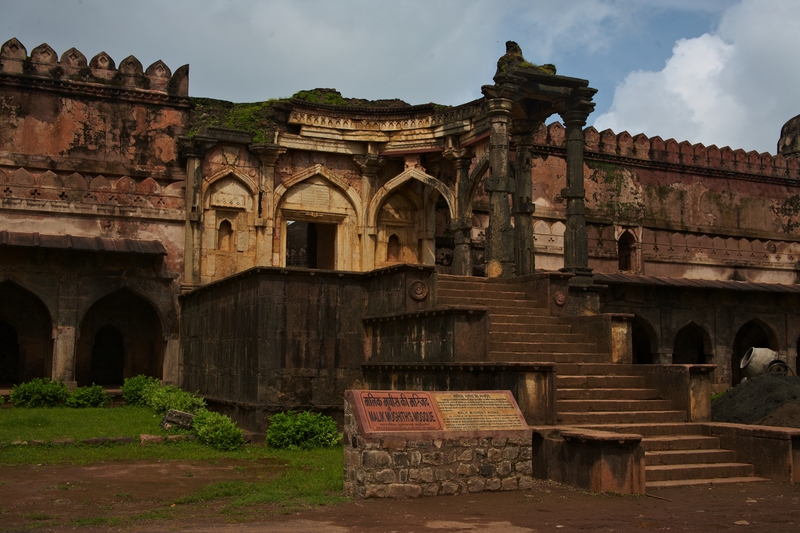 Ghiyasuddin became the king of Mandu at the age of 55 after murdering his father. He maintained an entire inner city of women— there were 15,000 in his harem. But this pleasure loving king should rather be remembered for the greatest monuments in Mandu— one of them being the Jahaz Mahal, a palace sandwiched between the Manao taal and the Kapur taal lakes. This four-storeyed structure, with two storeys underground, boasts of an efficient Persian wheel system for hot and cold water. The beautiful water filtration system, shaped like a serpent, shows the proficiency of the architecture of that time. The monument is said to have been first used by a Hindu Parmar king. The amalgam of Hindu-Islamic and Jain architecture in the monuments is obvious in the ruins. Hindu beams artfully merge with Islamic arches. The synthesis is best expressed in the Hindola Palace which was used as a conference hall by Ghiyasuddin. One can also find some Rajputana style of architecture in the palace. The sloping walls of Hindola palace with its perceptible tilt of walls creates an illusion that it is swaying. The air-conditioned walls of Champa-Baondi and the Royal palace – Jahaz Mahal are all monumental efforts for leisure. Another notable monument is the Hammam— the royal sauna. Amongst these lie some ruined monuments in disarray that gives no clue of their original layout. At a little distance from the Royal Palace comes the village group of monuments – the Jami Masjid and the Hoshenshah’s tomb. The Jami Masjid is said to be modelled along the lines of the great mosque at Damascus. Its western wall bears 17 inches of lovely design and carving. There is a beautifully ornate marble pulpit next to the central niche. The perfectly proportioned domes of the mosque will surely arrest you with its magnificence. 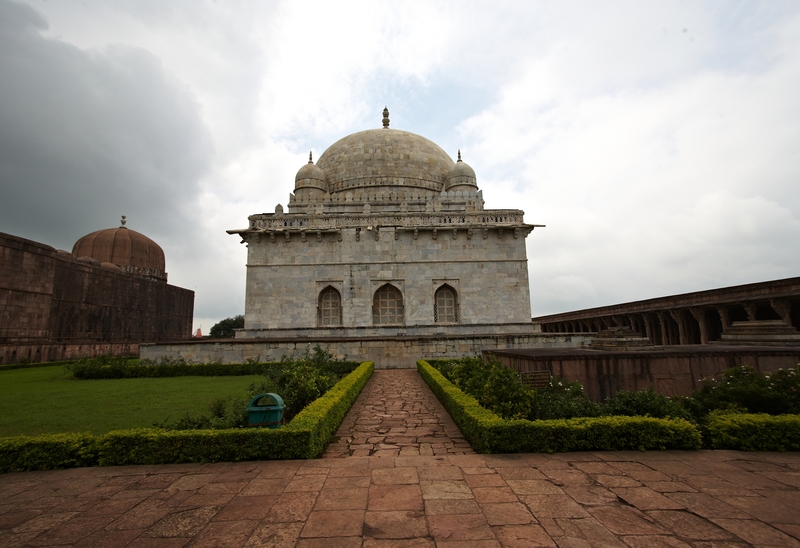 Hoshenshah’s tomb – one of the first monument built in white sandstone. The architectural beauty of this place reaches its pinnacle as one takes a look of the Hoshanshah’s tomb, said to have inspired the magnificent Taj Mahal. The tomb was the first marble structure in the country showcasing the supreme elegance of the Afghan architecture. The tomb has a very soothing interior with jalis to let the sunshine in. At a distance of about 2 kms from the tomb lie the Sagar Talo group of monuments. Set against the backdrop of the sagar taal, the monuments present a prosaic feel of history and art. It is a set of far flung buildings amidst water and greenery with a certain lack of grandeur but beatified with a hypnotic appeal. There is Dai ka Mahal (wet nurse’s palace) and the Dai ki Bahen ka Mahal, a very picturesque little eight-sided structure. The Malik Mughith Mosque, built in 1432, has an ingeniously made porch in the front and copious Hindu temple pillars inside, which give an impressive effect. A must at this place is the Echo point – an amazing exhibition of acoustics of the 15th century. The next group of monuments is the Rewa Kund monuments. 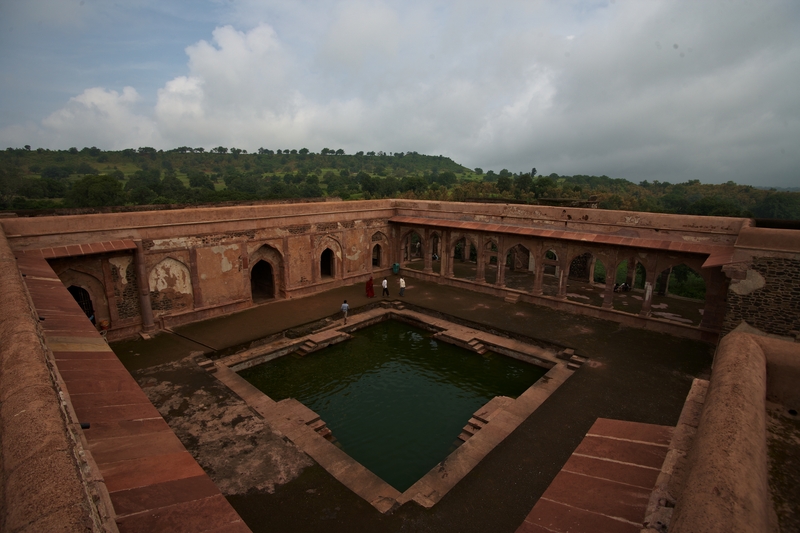 Adjacent to the water body is the palace of the then ruler of Mandu Baz Bahadur. 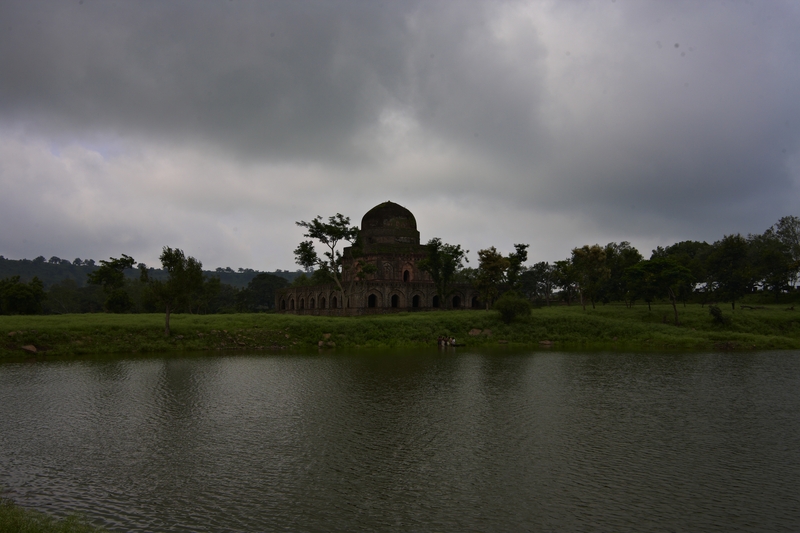 On the lofty crest of the hill, some meters away from the Rewa Kund stands the pavilion of Rani Roopmati. This is the place from where she used to offer prayers to the river Narmada. The kund itself is considered to have the sacred waters of the river. A complete parikrama of the Narmada is said to take 3 years, 3 months and 3 days, culminating in a dip in Rewa Kund. The Rupamati Pavilion offers the viewer a panoramic view of the entire Nirmar plains. 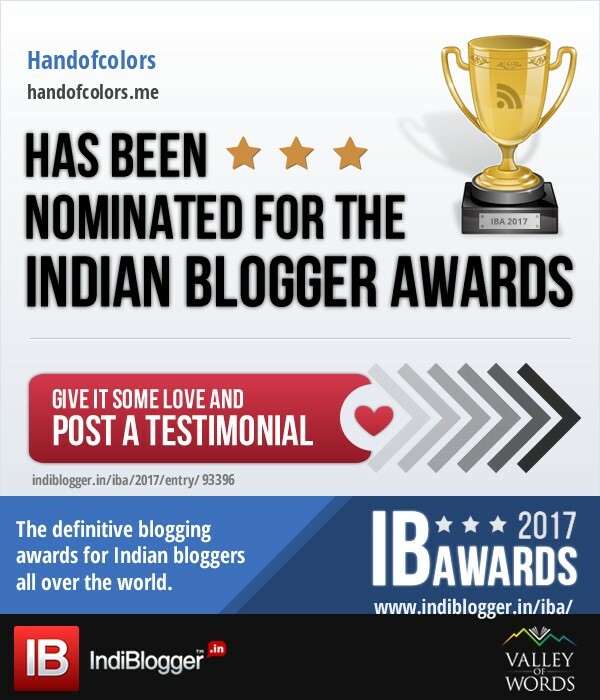 The royal residence has been witness to the glorious love story of Baz Bahadur and Rani Roopmati, the tales of which have got deeply ingrained in the folklore of the place. The beautiful love story of the two can still be felt in the surrounding silence. This is a love story of an ordinary village girl, extraordinarily beautiful and blessed with a divine voice, and a Sultan— handsome, a lover of music and poetry, and content in his small fort kingdom up on a hill. In the natural frame of dark, looming clouds; the monuments stood like an apparition in the distance singing the tragic tales of this love story. The old walls tell tales of the tragic war between Akbar’s army and Baz Bahadur’s and the suicide of Rani Roopmati to save her chastity. The beauty of the place has been captured and made immortal in the beautiful song of the movie Kinara ‘Naam gum jayega, chehra yeh badal jayega’. The beautiful lines of the song personify the eternal glory of this beautiful land. This is a land of kings and queens, of love, lives and lies – a land where history is shrouded in the myriad mosaics of nature. Even after spending days in Mandu, one will always find stray jewels one missed to see. 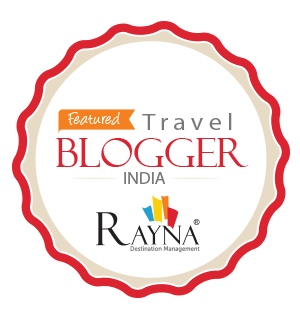 The elegant contours of the caravan serai, the enormity of the Hathi Mahal, where hordes of elephants were kept, the Gada Mahal and other such monuments capture your imagination with their anonymity and streaks of history trapped in them. Ruins of an old Mosque which displays both hindu and Islamic architectural style. Mandu is poetry in stone, a song of life, and an elegy of death. The very lights of the rising sun opens the gate to a a land caught in an eternal time warp – a land of a beautiful queen, a besotted king, a land of music, love and joy.